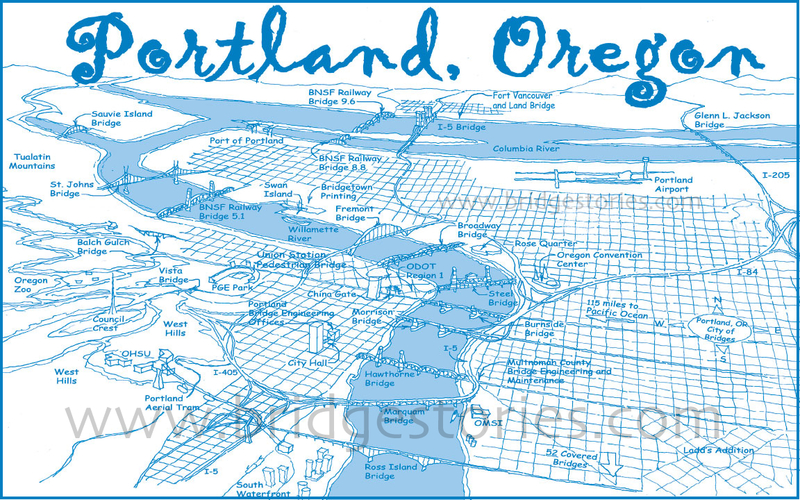 The big river bridges of Portland, Oregon and Vancouver, Washington profiled with photographs and drawings from the Historic American Engineering Study of the Willamette River Bridges for the National Park Service/Library of Congress in 1999. 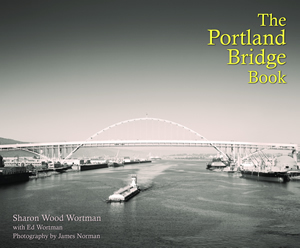 Includes poetry, maps, chapter on “How and Why Bridges are Built” (by Ed Wortman), glossary, Portland Transportation History Timeline, with emphasis on construction of the WRBs, many illustrations and drawings, and stories. For example, where exactly the Fremont Bridge—the longest tied-arch bridge on this side of the world—cracked during construction. Available from Urban Adventure Press, PO Box 3403, Portland, OR 97208; 503 222-5535 phone. All Portland-area independent bookstores, including Powell’s on Burnside. Available to classrooms since 2005, can now be purchased by individuals. $55, includes illustrated step-by-step direction, seven patterns of local truss bridges, low-temperature glue gun, directions for safely using glue guns, glue sticks, already assembled side truss, supply list, glossary of engineering terms, and more. In 16 steps, elementary students (with the help of adults), design and construct a wooden truss span that can be test loaded. Students also create bridge piers (substructure), attach the truss (superstructure), and then test the completed bridge for strength. In this activity, engineers build on existing social studies, geography, math, science, and writing curriculum. 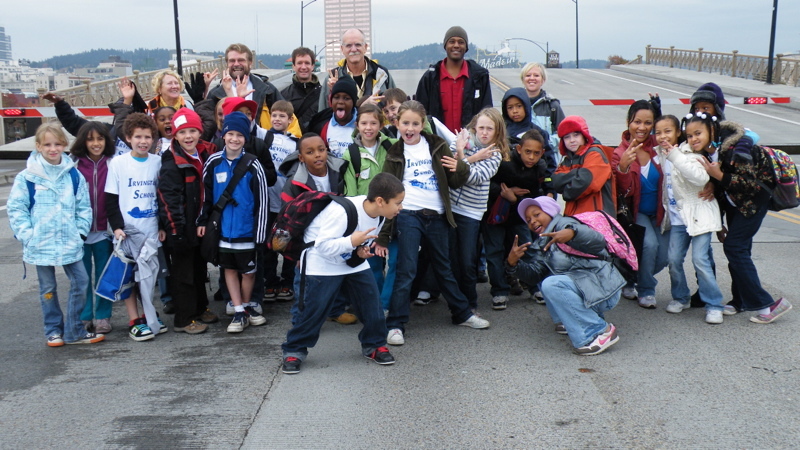 They are introduced to the various truss types of the larger Willamette River bridges and may choose the same truss types for their individual model bridge. Since the Willamette River bridges represent universal types, this “naming” makes it possible to recognize bridge shapes found everywhere. In the Portland-Vancouver area, we have the oldest operating vertical lift bridge in the U.S., likely the world; the only double decker lift of its kind, and the longest tied-arch bridge in North America. Depending on our route (no walks ever exactly the same), we test for synchronous vertical excitation, make triangles with our bodies to "get" tension and compression, and look for opportunities to demonstrate the cantilever principle. Time: 2-4 hours, or as scheduled. For all ages and group sizes (guide carries a hand-held microphone). 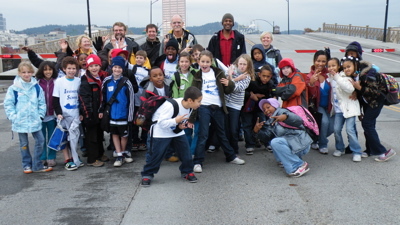 Most student and adult groups meet at the corner of NW Second and Everett, visit the Oregon Department of Transportation's Region 1 Willamette River Bridge exhibit for a Bridge 101 introduction. Then, if the sky isn't leaking like a boat, we tour the operator's tower and bascule pit of the Morrison Bridge. (Our rain bridge is the Burnside, shown in photo). Walks, ADA-accessible, are about a mile long. We usually cross three bridges, seeing eight in all. Note: Walk dates for school groups are limited to three days a week, so reserve early. 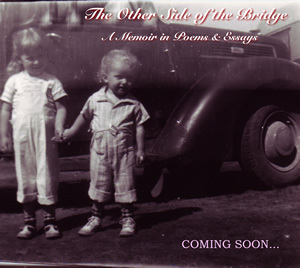 BridgeStories: A Storytelling Slide Show - Named "Crossover Artist of the Year" in Willamette Week's 2006 "Best of Portland" edition, Sharon presents rare and unusual images in a 55 minute collection of music, short video clips, and stories. See all measure of bridges: the singing, grasshopper, lighted, and London, as well as the longest tied-arch in the Western world, the country's oldest operating vertical lift, and the only double lift bridge of its kind in engineering history--the latter three found in Portland, Oregon. This multi-media presentation was a favorite in the Oregon Chautauquas of 1999-2002. Rolling Bridge (left), designed by Heatherwick Studios. 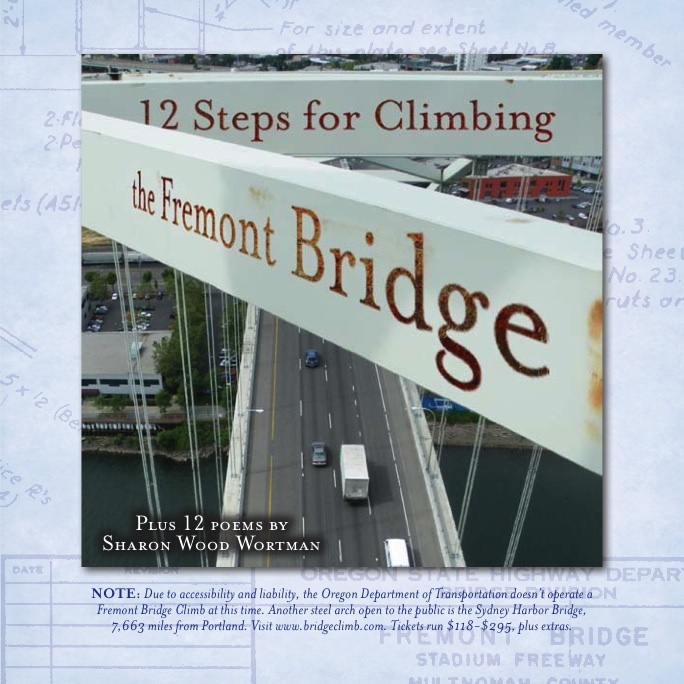 Comes with full-color booklet 12 Steps for Climbing the Fremont Bridge; a dozen of Sharon's poem, including “6th Inning Stretch Where We Decide that Sellwood, on the Disabled List, Makes a Perfect Manager,” and the song "The Band of Bridges," sung with Stephen Cohen. 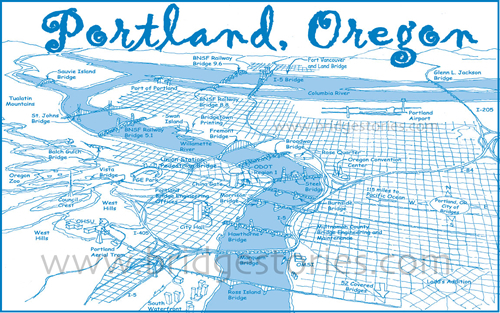 The Portland City of Water postcard is available from the Friends' Library Store at the main branch of the Multnomah County Library, 801 SW Tenth, Portland. 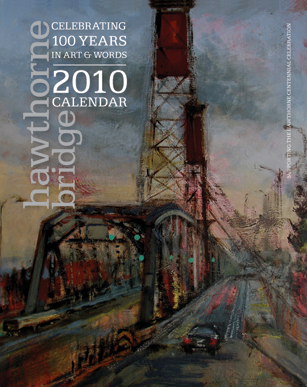 A collector's item, the 2010 calendar focuses on the Hawthorne Bridge, the oldest vertical lift bridge in the U.S., likely the world. 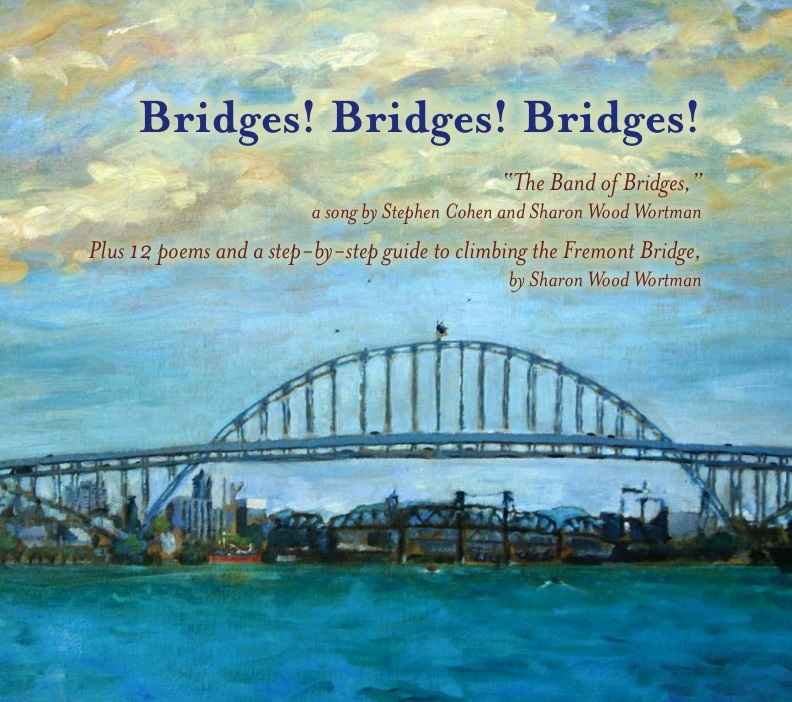 It features the art of 48 artists, including a poem by poet Paulann Petersen, and pen and ink-on-linen engineering drawings of the Hawthorne Bridge, drawn in 1910. 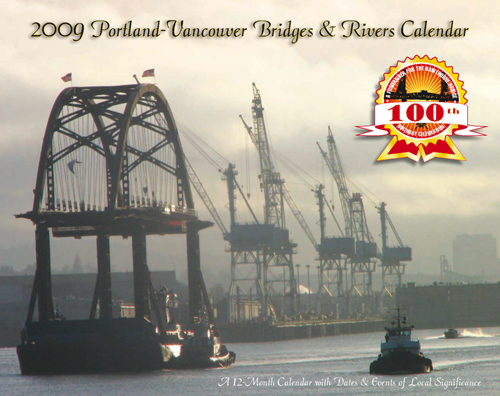 The 2009 calendar, also still available, features all the big river bridges, plus a guide and history of the three ferries still operating on the Willamette today. 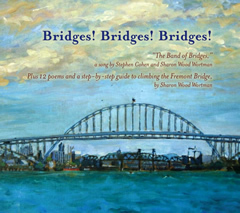 Created by the Friends of the Bridges, a volunteer citizens' group, and edited by Sharon Wood Wortman, Ed Wortman, and JulieAnne Poncet, sales of the 2009 and 2010 calendars benefit PDX Bridge Festival 2010. Both calendars were printed by Witham and Dickey of Northeast Portland. Send check, made out to PDX Bridge Festival, Inc., to PO Box 3403. $10 for each calendar includes mailing. Portland China Gate Postcard © Image by Sharon Wood Wortman used by permission of the Portland, Oregon Chinese Consolidated Benevolent Association. This “archival” postcard was created in the spring of 2005, during the blossoming of Northwest Fourth Street’s over-the-hill cherry trees just before they were cut to make way for this National Register district’s (officially named Portland New Chinatown/Japantown Historic District) new festival sidewalks. 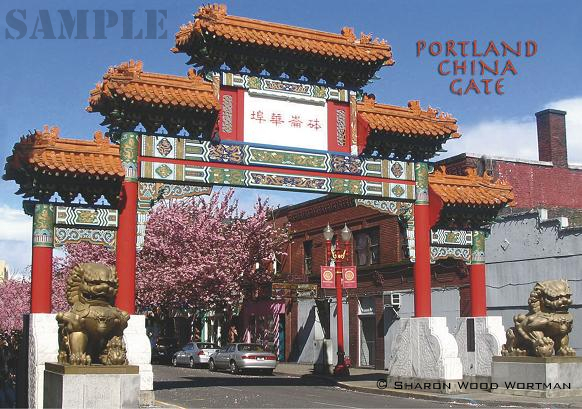 For informaton about exploring Portland's Chinatown on a walking tour, visit the Travel Portland website. through rows of yearning, where we ate lunch with all the fingers we could count on wearing elbow-length gloves of elegant purple.